ORTHOGEN and Dr. Shikhmetov from Gazprom Dayclininc in Moscow work together to better treat Osteoarthritis. ORTHOGEN’s innovative EOT®II blood preparation kit is used for the benefit of Gazprom employees in Russia. Employees and outpatients will get the state-of-the-art treatment with ORTHOGEN’s method to prepare Autologe Conditioned Serum from the patient’s own blood. Dr. Shikhmetov and his team have treated over 300 patients with knee osteoarthrithis so far. The outcomes of the treatment are in line with published clinical data as recently shown by Dr. Baselga (Spain) and Dr. Godek (Poland). 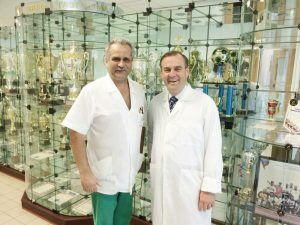 Dr. Shikhmetiv says „with the EOT®II blood preparation system, we have a powerful method to enrich interleukines and growth factors from patients own blood and we are extremely happy to work with such innovative technology“.